A really tasty cheesecake recipe with the added benefit of being gluten free. The fruit topping can be changed to any flavour you want to prepare. Try strawberry or raspberry, or combine the flavours of a few fruits to make a summer fruit topping. Lightly grease and line a deep, 18cm cake tin with a loose base. Wrap the outside of the tin with two layers of foil in preparation to use in a bain marie, to cook the cheesecake. Melt the white chocolate in a glass bowl over a small pan of hot water on a low heat. Stir until melted and smooth, then remove from the heat and set aside. Put the gluten free biscuits into a food processor, blend until the mixture forms fine crumbs and then add 50g of the melted white chocolate and melted MEADOWLAND Professional 250g, process until it starts to bind together. Turn out the crumb mixture into the base of the prepared tin and press lightly to make an even layer, do not press too hard. On a bain marie melt the white chocolate and reserve warm for the filling. In a large bowl, beat the soft cheese, sugar and vanilla with an electric mixer for 2-3 min. Add the yogurt, and the eggs one at a time. Being careful not to over-beat. Add in the melted white chocolate and mix until smooth. Pour the filling over the base in the tin and shake gently, to level. Place the cheesecake into a deep gastronome tray and pour boiling water into the side of the tray until it is half way up the tin creating a bain marie. Carefully place the tray into the oven. Bake for 20 min. It will have just set around the edges but still be wobbly in the middle. Turn the oven off and leave the cheesecake to cool slowly for one hour in the oven. Remove from the oven then allow to chill until ready to serve, preferably overnight. 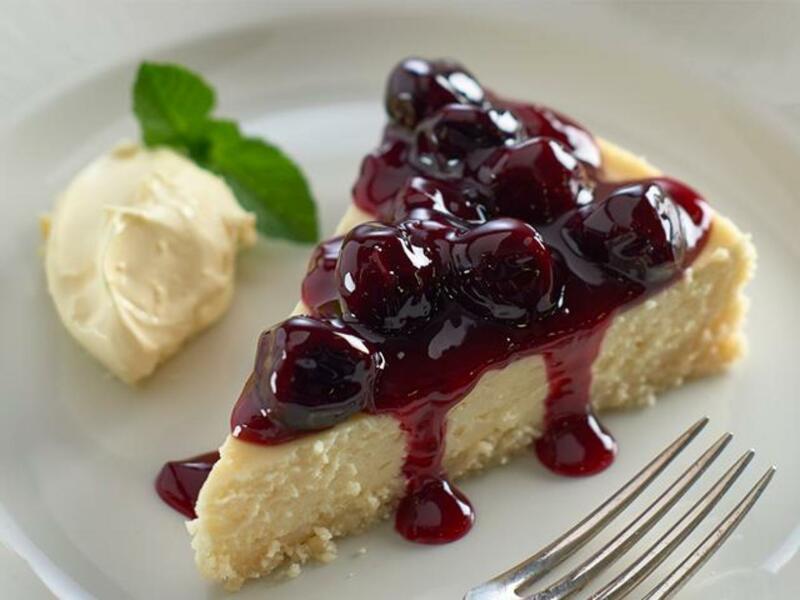 Before serving spread a layer of the cherry compote or conserve onto the top of the cake and cut into even portions.